Are you looking for continuing education units (CEUs) to complete your renewal application this year for the Department of Pesticide Regulation (DPR)? The UC Statewide IPM Program and the Lindcove Research and Extension Center have online courses available that can help you get those needed credits. All courses have moved to the pest management section of the national eXtension online campus system. Be sure to spend at least 1 hour on each unit to receive credit. 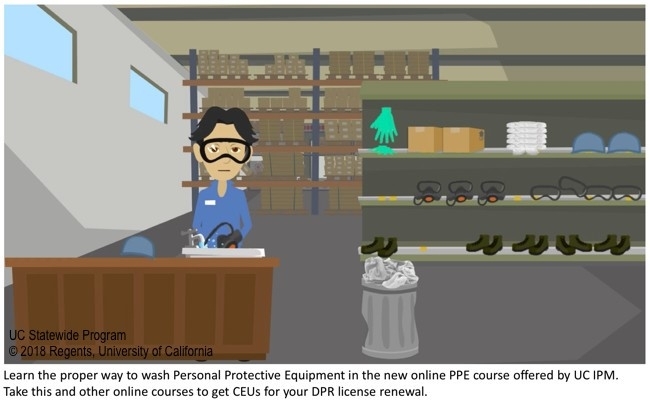 For a list of other approved online or in-person courses, visit the DPR website. UC IPM plans to add additional online courses in 2019. The Vertebrate Pest Council is hosting a seminar series this year in conjunction with new partner Target Specialty Products. Don't miss this unique opportunity to learn about wildlife management of a number of bird and mammalian species from staff at the University of California, California Department of Fish and Wildlife, California Department of Food and Agriculture, the Department of Pesticide Regulation and more! Both structural and DPR continuing education units are available and Vector CEUs have been approved for some venues. For more information on these workshops including speakers, costs, directions, and registration, please see www.vpconference.org. Respirator Education Webinar by UC Expert on Dec 12! On Wednesday December 12 from 3-4 pm, Lisa Blecker, Coordinator of the Pesticide Safety Education Program will cover the importance of respiratory protection, types of respirators used by pesticide handlers, how to determine when to wear a respirator, and federal and state requirements for respiratory protection. This information is critical for employers and supervisors to ensure compliance, and for applicators to understand how to protect themselves. There is a $10 fee and 1 CE unit of laws and regs for those attending the webinar. Register in advance for this and other webinars by going to the UC Ag Experts Talk website or by clicking on the respirator webinar event link. Learn about opportunities to receive continuing education hours. October is upon us and before you know it, we'll be wrapped up in the busy holiday season. If you hold a license or certificate from the California Department of Pesticide Regulation (DPR) and have a last name that begins with letters A through L, this is your year to renew. DPR encourages license and certificate holders to avoid the end-of-the-year rush and submit renewal applications by November 1. Early renewal has its advantages. DPR can take up to 60 days to process a renewal application. Submitting applications now not only avoids late fees and gives you time to fix any problems that DPR may find, such as not having enough continuing education (CE) hours to renew, but also ensures that you will have your new certificate or license by the first of the year. Without a renewed license in hand, you are not allowed to use or supervise the use of pesticides after January 1, 2019 until you receive it. You also run the risk of having to retest if there are problems with the renewal application and not enough time to fix them. NEW! UC Agriculture and Natural Resources (UC ANR) is also offering monthly webinars on specific pest issues for CEUs. 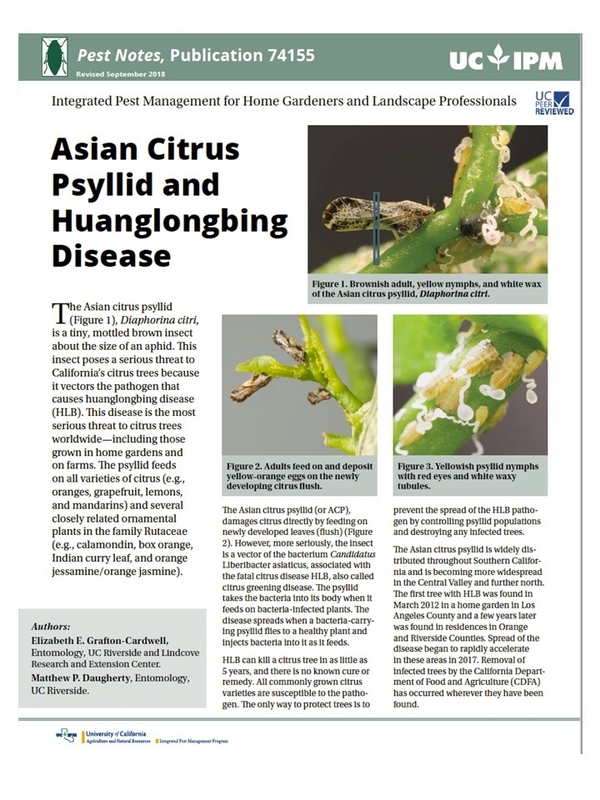 More information can be found on the UC Ag Experts Talk website. Check out the list of DPR-approved continuing education courses. For more information about license renewal, visit DPR's licensing and certification webpage. Learn about pest management and other training opportunities from UC IPM.